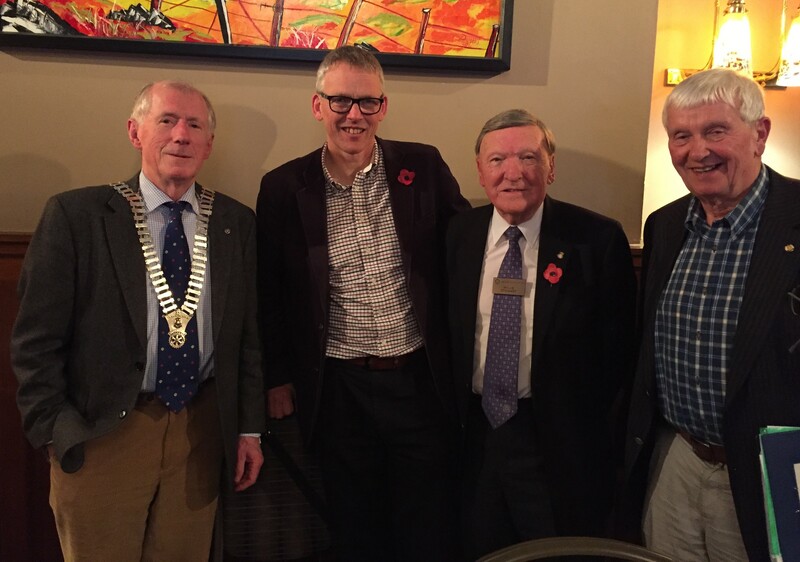 Ian amused his fellow Rotarians with an entertaining whistle stop tour of his beliefs, his experiences and his life philosophy. Originally from Dumfries, Ian first attended New College at the University of Edinburgh in 1986, where he focussed on the New Testament gaining a degree in 1989. After a probationary year in Edinburgh at St Andrew’s and St George’s church where he had the privilege of meeting many inspirational people including, Lord George MacLeod, founder of the Iona Community, and Lady Mary Davidson, organiser of the largest booksale in Scotland in aid of Christian Aid. Ian’s first church was Cowie linked with Plean just on the outskirts of Stirling, where he served from 1990-1994, and when he wasn’t preaching on a Sunday would enjoy kicking a football about with the local amateur team. Thereafter Ian moved to Castlehill church in Ayr where he served for 8 years, chaplain to various schools in Ayr and particularly enjoyed his engagement with World Mission department which gave him the opportunity to travel to various places around the world on behalf of the church, including to Leprosy hospitals in Nepal, and to refugee camps on the Israel / Lebanon border. Tibet was one of his most interesting stops where he met monks and experienced their beliefs and religious drivers. He also met the Grand Mufti, the highest official of religious law in a Sunni or Ibadi Muslim country, in the Middle East. After eight years Ian shifted into hospice chaplaincy with the Ayrshire Hospice. There, for over a decade he was privileged to meet people at a time when they face some of the deepest challenges of life and often are exploring what really matters in life. Even the Dunblane massacre benefitted from Ian’s pastoral care when he was asked to conduct a funeral for one of the victims. After fourteen years in the hospice Ian was looking to new horizons and is discovering a renewed energy and enthusiasm for life and spiritual wellbeing since recently taken up the job of minster at the beautiful churches of Fisherton and Kirkoswald and hopes to encourage a vision of building compassionate communities, and enhancing the health and wellbeing of everyone in the church and in the community. A worthy vote of thanks was given by Willie Stewart.